Fight cruelty. Save lives! Your gift makes a kinder world for animals through undercover investigations, rescues, humane education, spay/neuter, and high-profile advocacy campaigns. The single most important thing that we can do to save cats and dogs from all the suffering and death that their overpopulation causes is to spay and neuter them. Spay and neuter surgeries are routine, affordable surgeries that can prevent thousands of animals from being born, only to suffer and struggle to survive on the streets, be abused by cruel or neglectful people, or be euthanized in animal shelters for lack of a loving home. Thanks to your support, our fleet of mobile clinics has performed approximately 155,000 spay-and-neuter surgeries since it began operating in 2001. Spaying and neutering prevents cats and dogs from being born into a world that is already teeming with discarded animals. These unwanted animals would likely be dumped on the streets or would have to be euthanized in shelters. Thank you for helping PETA spare millions of animals a life of suffering. And we're not going to rest on our laurels: spay-and-neuter marathons and special events are held multiple times each year throughout Southeastern Virginia, in addition to our mobile fleet working daily. We're now working toward our 200,000th lifesaving surgery. 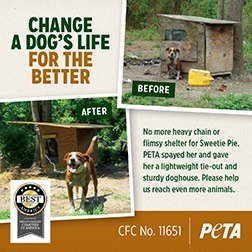 Participating in PETA's action alerts helps animals! The action page is updated monthly-take action now!